Charles Matthews I have no great confidence in my understanding of running fights, particularly the sort of ones that start on sides when adrenaline-soaked counter-pincers are made. I thought I'd start posting some examples with database analysis, to sort out the typical pro ways of handling them. 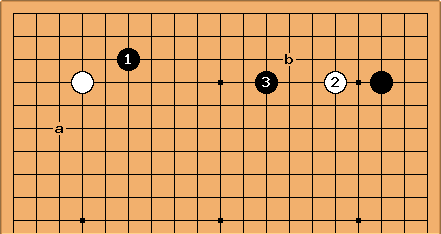 This is a normal type of side pattern current in pro games: prevents a mini-chinese, and now it starts to get interesting. In a game Matthew Cocke 5d (Black)- Quentin Mills 3d just played in the British Championship, was played (this is less common than Black a or b in pro games, but still often seen). In reply to , there were and then . 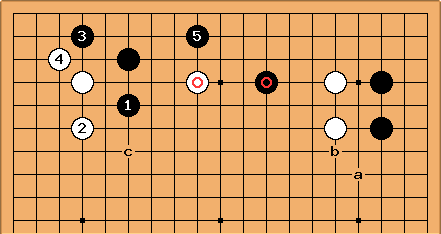 After that there are six groups on the side, and just one, Black's right-hand corner, is at all settled. Not so for . 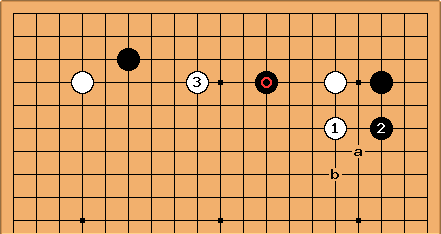 In 7 out of those 8 games, White jumped at b: which could be seen as preparation for the invasion, but gives away some territory. So now down to one model game Yang Chae-ho-Paek Seong-ho. by Yang, one of the strongest Korean 9 dans, is followed by the catenaccio joseki (see discussion at discarded joseki). Naturally Black is settling one group; while making hard to capture on a large scale - which can be called light play of a kind. Game continued White a, Black b.
Matthew Cocke continued with at c.